When working with GateCiti® Studio customer has the opportunity to select any gate element in any quantity as he/she wish.. 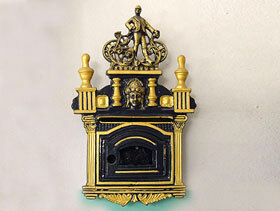 CAST IRONWORK Cast iron is produced in a furnace stoked with alternate layers of coking iron then poured into molds. After the iron cools off, the sand is cleaned off. The Chinese were the first to use cast iron from the 6th century AD using it as support for pagodas and other buildings. It was introduced into Europe by the 15th century with its main decorative uses being as fire backs and plates for wood burning stoves in Germany, the Netherlands and Scandinavia. By the end of the 18th century, cast iron was increasing used for railings, balconies, banisters and garden furniture due to its lower cost. 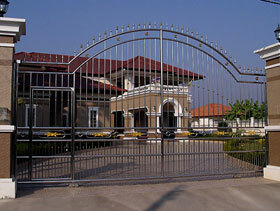 Main Gate :: A gate is a point of entry to a space enclosed by walls, or an opening in a fence. 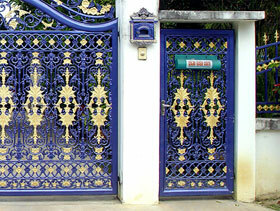 Gates may prevent or control entry or exit, or they may be quite decorative. Other terms for gate include yett and port. Larger gates can be used for a whole building, such as a castle or fortified town, or the actual doors that block entry through the gatehouse. Today many gate doors are opened by an automated gate operator. 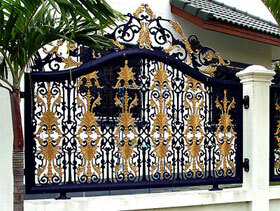 Main Gate with a Build-in Walk Gate :: Ironwork is any artwork, utensil or architectural feature made of iron especially used for decoration. 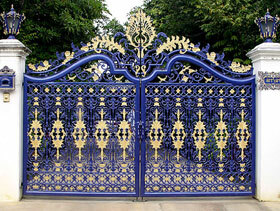 There are two main types of ironwork wrought iron and cast iron. While the use of iron dates as far back as 4000BC, it was the Hittites who first knew how to extract it and develop weapons. 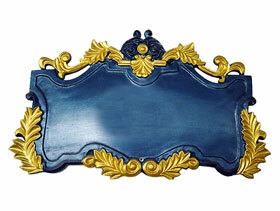 Use of iron was mainly utilitarian until the Middle Ages, it became widely used for decoration in the period between the 16th and 19th century. Door or Walk Gate :: A door is a panel barrier, that is used to cover an opening in a wall or partition going into a building or space. A door can be opened to give access and closed more or less securely. Doors are nearly universal in buildings of all kinds, allowing passage between the inside and outside, and between internal rooms. When open, they admit ventilation and light. Fence :: A fence is a freestanding structure designed to restrict or prevent movement across a boundary. It is generally distinguished from a wall by the lightness of its construction: a wall is usually restricted to such barriers made from solid brick or concrete, blocking vision as well as passage (though the definitions overlap somewhat). Number Sign or Label :: A label is a piece of paper, polymer, cloth, metal, acrylic plastic, or other material affixed to a container or article, on which is printed a legend, information concerning the product, addresses, etc. A label may also be printed directly on the container or article. Labels have many uses: product identification, street number, owner's name, property name, advertising, warnings, name tags, and other communication. 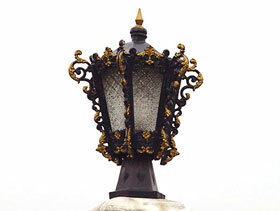 WROUGHT IRONWORK is forged by a blacksmith using an anvil. The earliest known ironwork are beads from Jirzah in Egypt dating from 3500 BC and made from meteoric iron with the earliest use of smelted iron dates back to Mesopotamia. However, the first use of iron dates back to the Hittites from 2000BC.